For any denim worshipper, a sale on a favorite brand of jeans is as much of a miracle as manna falling from the heavens or feeding thousands on five loaves of bread and two fish. It probably seemed too good to be true when it appeared that True Religion was selling their jeans at a fraction of the normal retail cost on discount websites. And it was. According to the Los Angeles Times, global trade of counterfeit goods is estimated at well over $600 billion dollars a year. As a result, True Religion - among many brands - has been fighting counterfeits for years and paying their counsel and anti-counterfeit enforcers handsomely to protect brand integrity and put a stop to the misuse of their label. The investment in their legal representation seems to have paid off when earlier this month a New York district court judge ordered more than a hundred websites selling counterfeit True Religion jeans out of China to pay True Religion $8.15 million each, for a total of $864 million in damages. Whether True Religion will ever see any of these damages is unknown but perhaps the true success for the denim brand is that the judge also ordered that all of the sites be disabled and their domain names transferred to True Religion. Hallelujah. If the thought of counterfeits makes your blood boil, check out Brand Integrity: Strategies for Fighting Contraband and Counterfeit Goods, by Craig A. Stewart, Anthony J. Franze, and Evelina Norwinski. KF3197.5.B73 2011 at Classified Stacks. 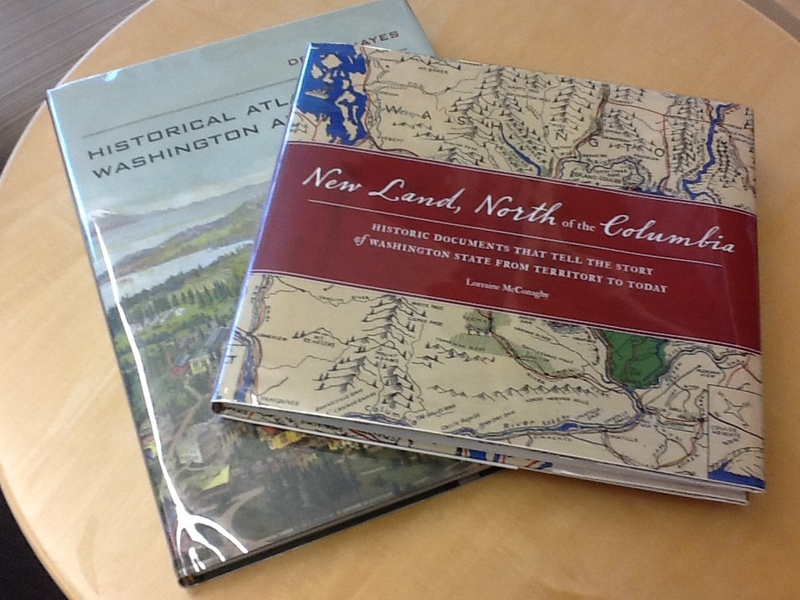 Two new books in our Good Reads collection allow you to see Northwest history through maps and documents. Derek Hayes, Historical Atlas of Washington and Oregon (F891.H39 2011 at Good Reads) has lots of maps, as you'd expect from the title, but also includes essays discussing the context and significance of the maps. And there are drawings and photographs, too—for example, the section on water and power (pp. 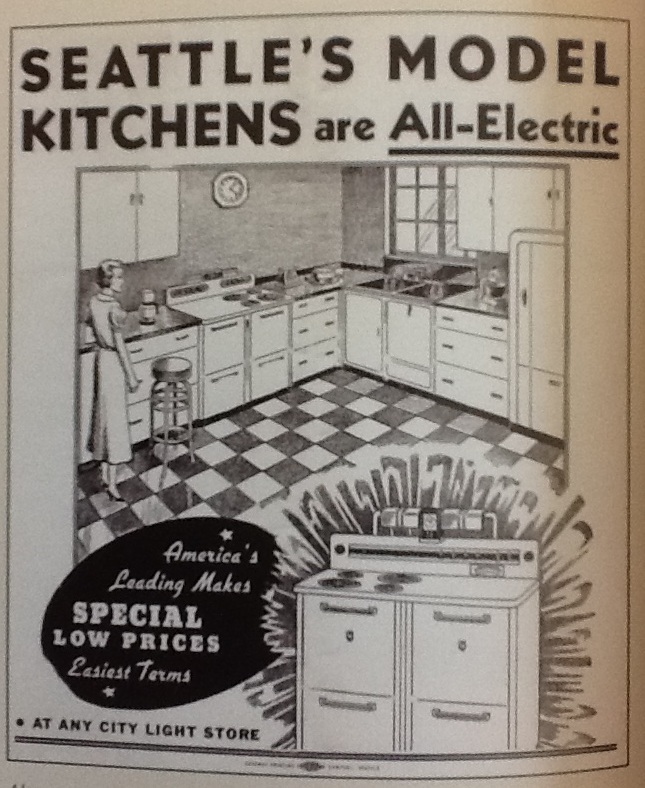 186-91) includes maps, a vintage brochure of the Skagit Power Project, a diagram of the Bonneville Dam, and a 1937 ad proclaiming that "Seattle's Model Kitchens are All-Electric." Lorraine McConaghy, New Land, North of the Columbia: Historic Documents That Tell the Story of Washington State from Territory to Today (F891.M447 2011 at Good Reads) has a wide range of documentary material: postcards, photographs, posters, legal documents, newspaper stories, menus, even a paper doll (p. 95). In just the first thirty pages, you can see the first marriage certificate in King County (Arthur Denny married Louisa Boren) (p. 3), the Point Elliott Treaty between the federal government and several tribes (pp. 4-5), the inventory of a decedent's estate in 1874 (p. 17), documents about anti-Chinese violence in 1885-86 (pp. 22-23), the summons in a case about women's suffrage (p. 27), the telegraph announcing Washington's statehood on Nov. 11, 1889 (p. 28). 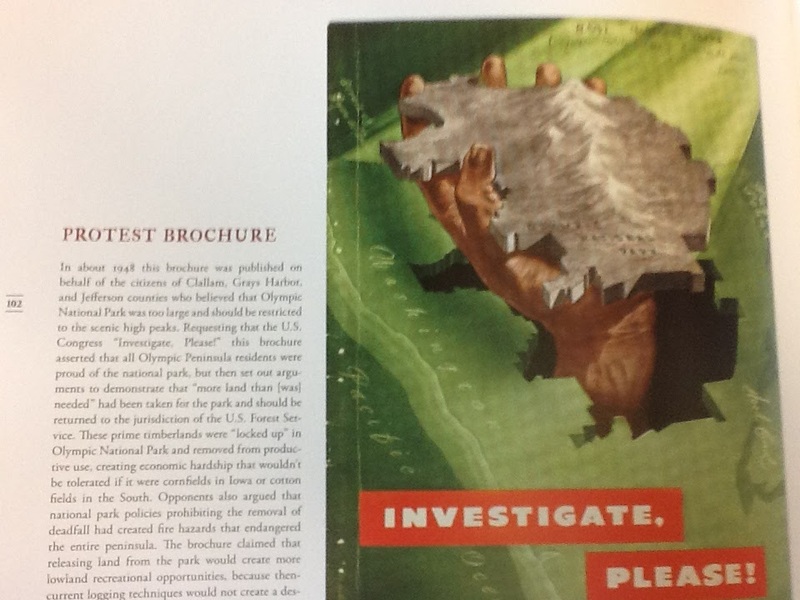 A brochure (p. 102) asks Congress to investigate the size of the Olympic National Park—some citizens thought that it was too large; more should be in the National Forest and hence available for logging and other productive uses. 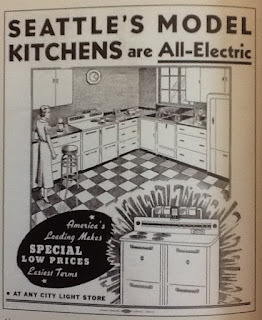 You can also see flyers from the local elections to create Metro and clean up Lake Washington (p. 106), to save the Pike Place Market (p. 117), and to fund the Kingdome (p. 121). There's a handwritten letter from Washington Territory's surveyor-general in 1860, protesting the actions of Canadians who had helped his slave escape to Victoria (p. 11). You can browse information and documents about industry, culture, labor, war. A poster for the 1995 Lesbian/Gay/Bisexual/Transgender Pride March/Parde & Freedom Rally in Seattle (p. 137), the application for a patent on what became the Sonicare toothbrush (p. 136), documents from the Industrial Workers of the World (pp. 68-69), a songbook from the Senior Loyal Temperance Legion (p. 56), . . . 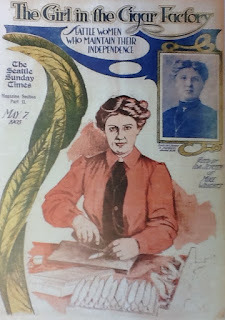 I could go on and on, but I'll stop with one more: a Seattle Times magazine section cover, "The Girl in the Cigar Factory," from a series on Seattle working women (p. 40). These books are packed with information as well as with beautiful and arresting images. Take a look! 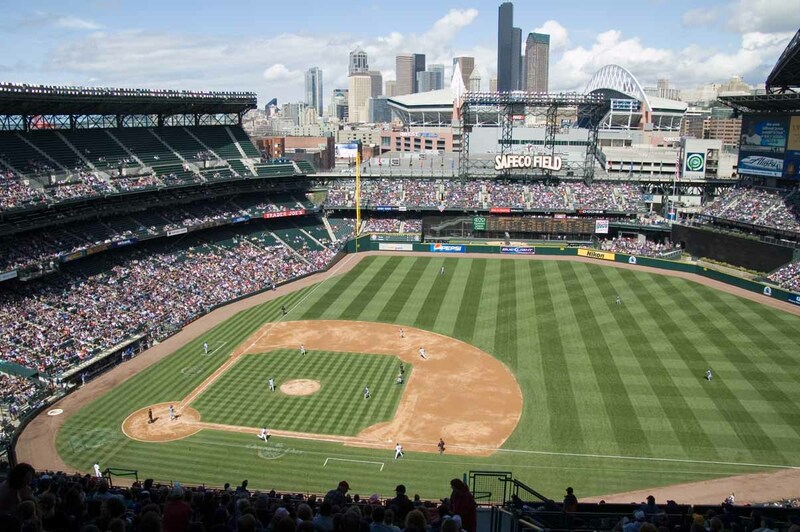 This Wednesday, the Seattle Mariners and the Oakland Athletics will open their regular season. If you are already burning the midnight oil to get a jumpstart on the quarter, you do not have to go to bed at all! You can just stay awake until 3:10AM (the game is being played in Japan, at 7:10PM Japanese Standard Time). The Little White Book of Baseball Law, by John H. Minan and Kevin Cole. Available in the Good Reads section. *Recommended bedtime reading means that it is fun, not that it is boring and will put you to sleep. 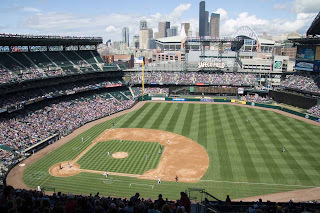 Photo of Safeco Field by SD Dirk. No doubt many of you are already planning how you will celebrate National Library Week, April 8-14, 2012. And why not, given how vital the Law Library and its staff are to your academic success! I have one more event to add to your crowded schedules: The Inaugural Gallagher Law Library Peepshow Contest! 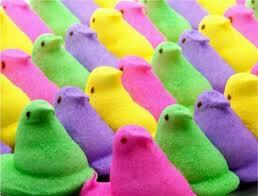 Grab some peeps (the colorful candy variety) and stage them in humorous or dramatic vignettes. Then snap a photo and send it to Cheryl Nyberg, with a title and short description (if the image doesn't peep for itself). Short films are also acceptable. The entry deadline is Monday, April 9th. Voting for the winner in each category will begin on Tuesday, April 10th and winners will be announced on lucky Friday the 13th. All entries must be original. That is, you cannot reproduce a setting from the American Bar Association's Peeps in the Law contests or similar Peeps-featured settings. You may, however, derive inspiration from these sources. Entries may be submitted by individuals or groups. Entrants agree to permit the Gallagher Law Library to use submitted images and movies in noncommercial advertising or promotion. The contest is open to students, faculty, and staff of the University of Washington School of Law. Judd Apatow was on NPR's radio show Fresh Air in 2009 where he explained that to distract himself when falling asleep, he began listening to podcasts, in particular Fresh Air, which is simply the radio show available for download as an mp3 file on iTunes or on the NPR website. Oddly enough, I was listening to this particular episode while trying to fall asleep after a stressful day at the office, and it was reassuring to know I wasn't the only one out there who had discovered the escapism of podcasts. Oftentimes they're better than a book when trying to fall asleep because you can simply turn off the lights, close your eyes, and listen. I found this particularly helpful when studying for the Washington State bar exam, and I wish podcasts had been around when I sat for law school exams! But podcasts aren't just great for soothing the troubled mind. They're also a fantastic way to distract yourself when you exercise and can help you learn something new. Another pair of podcasts produced in part by the Discovery Channel have shorter, often humorous explainers to educate you in a painless way: Stuff You Should Know and Stuff You Missed in History Class. Podcasts can also be a way to learn about a new area of law or keep up-to-date on current legal issues. Handel on the Law covers common legal issues in a newsy way, and a number of universities post law lectures on iTunes. So the next time you're looking for a distraction, try a podcast. They're usually free and entertaining---two of my favorite qualities in a distraction. Robert W. Gomulkiewicz, Enforcement of Open Source Software Licenses: The MDY Trio's Inconvenient Complications, 14 Yale J. L. & Tech. 106-37 (2011), available at http://ssrn.com/abstract=1790022. In his latest article, Professor Gomulkiewicz carefully examines three software licensing cases decided by the Court of Appeals for the Ninth Circuit: Vernor v. Autodesk, 621 F.3d 1102 (9th Cir. 2010) [Court Westlaw LexisNexis]; MDY Industries v. Blizzard Entertainment, 629 F.3d 928 (9th Cir. 2010) [Court Westlaw LexisNexis]; and UMG Recordings v. Augusto, 628 F.3d 1175 (9th Cir. 2010) [Court Westlaw LexisNexis], which he calls the “MDY Trio.” He suggests a refinement to the license versus first sale test articulated by the Ninth Circuit in these cases, as well as an alternative approach to differentiating between a contract covenant and a license condition. The article is organized in three sections. Section I describes open source licenses and enforceability under the Court of Appeals for the Federal Circuit’s opinion in Jacobsen v. Katzer, 535 F.3d 1373 (Fed. Cir. 2008) [Court Westlaw LexisNexis]. Section II discusses the first sale doctrine and end user license agreements, and further delves into the “inconvenient complications” arising from the MDY Trio. Section III explains the difference between conditions and covenants, and proposes a multifactor, sliding scale approach in the context of injunctive relief. In the next two weeks, the Supreme Court will hear arguments about issues that range from sentencing guidelines to mandatory health insurance. To help readers get in the mindset for news from the court, we've prepared a special crossword puzzle, inspired by the reporting of NPR's legal affairs correspondent, Nina Totenberg. When Tory Burch created her gorgeous flats, female attorneys everywhere rejoiced that they no longer needed to hoof in 4-inch pumps to court but could wear comfortable, courtroom appropriate, and beautiful flats! Tory may have to wear some of her flats to court as well due to some issues with her ex-husband, Chris Burch. Chris Burch recently stepped down from his co-chair position at the Tory Burch brand. While the couple has remained publicly amicable since their 2006 divorce, trouble seems to be brewing between their brands. against former co-chair Chris Burch for perceived similarities in his brand, C. Wonder or a breach of fiduciary duty remains to be seen. The conflict is fraught with potential trademark law issues, corporate law issues, family law issues and community vs. separate property issues. The library has a myriad of relevant resources. See our trademark law research guide, corporate law research guide, and family law research guide. All the potential issues could cause major migraines for attorneys on both sides, but hey, at least their feet won't be hurting! If you sit in the back of a classroom, you can spot some laptop screens with Facebook, ESPN, or Spider solitaire, but you also see screens with notes or class-related texts. Some students seem to be doing non-class stuff most of the time, while others just pop into email for a moment here and there. Critics think all of this is a sign that students are not committed to their education. But what's really going on? Kim Novak Morse, a professor at Saint Louis University, is working on a Ph.D. in higher education and took on the laptop-in-class issue for her dissertation research. She found that most students are on-task most of the time. In her sample, second-year students were off-task more than either 1Ls or 3Ls. And, perhaps surprisingly, the students who were off-task the most often did just fine in the class: there was no correlation (negative or positive) between time off-task and grade. See Karen Sloan, 2Ls are worst offenders when it comes to laptops vs. lectures, Nat'l L.J. Feb. 29, 2012. For more detail, see this handout from a presentation Prof. Morse gave at a conference on law teaching at New York Law School last June: Redirecting Laptop Users' Attention: Lessons from the Field. Univ. of Washington Research Commons Green A. The Research Commons is located in the Allen Library (South Wing). Please join us on Friday, March 16 on the UW campus to watch the national webcast. March 11 – 17, 2012 is Sunshine Week: Your Right to Know. Sunshine Week is a national initiative to promote a dialogue about the importance of open government and freedom of information. Sunshine Week 2012 National Dialogue is brought to you in celebration of Sunshine Week by the American Association of Law Libraries, American Library Association, Association of Research Libraries, League of Women Voters, National Freedom of Information Coalition, OMB Watch, OpenTheGovernment.org, Project On Government Oversight, Sunshine Week, Special Libraries Association, and the Sunlight Foundation. The Law Library will operate on a reduced schedule during the week of interim between the end of Winter quarter classes and the beginning of Spring quarter classes. Tuesday through Friday, March 20 - 23, the Library will open from 8am - 5pm and the Reference Office will be open from 9am - 12noon and from 1 - 4pm. Is Your Speech Being Jammed? What would you do if all of a sudden you weren't able to speak? The savvy editors at the technology review blog at MIT identified a new technology that could very directly disrupt one's free speech rights. The device is a curious black box sitting on a trigger handle. When pointed at people and activated it can completely befuddle speakers, causing them to break down in a stuttering mess. The actual paper by Kurihara and Tsukada introducing the device and research can be found here. Here are a few links to other devices that could be used to squelch one's 1st Amendment rights. We’ve all watched videos on YouTube, and maybe some of us have uploaded our own videos to the ubiquitous service in the hopes of becoming, at the very least, Internet famous. With individuals free to upload videos of their choosing, one of YouTube’s biggest concerns is violation of copyright due to the unauthorized use of copyrighted material. YouTube provides a service called Content ID for copyright owners that creates and stores an identification file for copyrighted audio and music in a database. When someone uploads a video to YouTube, the Content ID service compares the uploaded content against the database and identifies any copyright violations. When a match is found, the copyright owner is notified and and given the choice to block the video, track its viewing statistics, or add advertisements to the infringing video. Because this service is automated and not 100% accurate, it has been highly controversial. While it is well-known that video content providers don’t enjoy having their creations uploaded by users, you may not have considered that the owners of copyrights for audio content can also request that their work be removed from users’ uploads. A YouTuber who recently uploaded a video of himself foraging for a salad in the wild found himself ensnared in a troubling situation when Content ID flagged his video as matching licensed material owned by the Portland, Oregon, music licensing firm Rumblefish. The only problem? The user’s video had no music at all, just the sounds of the natural world. Andy Baio has all the sordid details on this kerfuffle at Wired (as well as some updates at his personal blog), but essentially, the user here has been innocently caught in a predicament, as claimants are given essentially total discretion over whether to block the allegedly infringing content. In this case, a representative from Rumblefish either mistakenly or intentionally blocked the user’s non-infringing video, leaving the user with no recourse but YouTube’s support forums. Content ID is a fallible system that gives unwarranted discretion to copyright owners, who are able to abuse the review process or often simply don’t understand principles of copyright law, especially the fair use doctrine. Content ID was intended to expedite and simplify the copyright violation review process in favor of the slower Digital Millennium Copyright Act (DMCA) review process, which allows recipients of takedown notices to counter-claim to dispute alleged violations. Content ID may actually violate DMCA’s safe harbor provisions by allowing copyright owners to skirt the DMCA review process and prevent, at the owner’s discretion, a non-infringing user from disputing the alleged copyright violation. As it is, YouTube’s copyright review process, while a profitable source of income for YouTube--to the tune of 1/3 of YouTube’s revenue--prevents innocent, non-infringing YouTube users from being able to pursue claims against mistakes or abuses enabled by the flawed Content ID system. 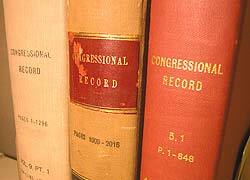 On this date, the Government Printing Office (GPO) published the first issue of the Congressional Record, detailing House and Senate proceedings from the prior legislative day. Although both houses kept minutes in their respective Journal, the appearance of an official, full transcript of legislative activity ended an 84-year debate about how best to compile congressional proceedings. Since 1789, Congress had lacked a verbatim record of its daily events. Initially, the House and Senate each accredited a select group of reporters who often wrote for partisan presses, or for the “recognized organ” of the party in power. Throughout the nineteenth century, these short-lived publications jockeyed to become Congress’s official record. But two mainstays, the Register of Debates and the Congressional Globe, began a half-century competition for official approval. In 1825, reporters Joseph Gales, Jr. (Senate) and William W. Seaton (House) compiled their daily notes into the Register of Debates, a substantial but incomplete record of Congress from 1824 to1837. The Register’s popularity led Gales and Seaton to assemble the Annals of Congress, a 42-volume set of congressional proceedings covering the years 1789–1824. Having culled sources from the Journals and newspapers, and after petitioning Members for speeches, Gales and Seaton earned praise for the Annals. President Jackson’s administration criticized the Register, however, accusing it of favoring anti-Jackson and Whig politicians. To compete with the Register, a popular startup paper called the Congressional Globe, compiled by former printers Francis Preston Blair and John Cook Rivers, began what would become a long publication run, surpassing the Register. By the late 1840s, new technology had changed reporting. With the advent of precise shorthand transcription in 1848, many debates were printed in full. As accuracy improved, Members and Senators made the Congressional Globe their official organ, even though it remained a private publication. After the Civil War, Congress authorized the GPO to take over its publication, and changed its name to the Congressional Record; the Globe’s reporters remained on staff. The New York Times lauded the Record’s first volume, noting that it was “decidedly neat in appearance and convenient in shape.” Reporting in the Record stayed much the same until 1941, when Speaker Sam Rayburn of Texas ordered color commentary removed from its pages. Rayburn reasoned that the annotations “applause,” “loud applause,” “laughter,” and “boisterous laughter” did not affect the course of debate and were therefore not germane to the official record. HeinOnline is building a big digital collection of Congressional committee hearings in its U.S. Congressional Documents Library (U.S. Restricted). The number of hearings currently available is more than 3,200. These resources come from Covington & Burling's hearings collection, which covers from 1927-2001 (71st-107th Congresses). Hein will harvest hearings after 2001 from the U.S. Government Printing Office's FDsys site. Hein plans to add a thousand hearings a month, leading to more than sixteen thousand hearings and more than 5 million pages. The hearings collection is a wonderful complement to the digitized Congressional Record already available on HeinOnline. Congressional committee reports are available online via the Readex U.S. Congressional Serial Set, to which the UW Libraries subscribe. All three of these sources--hearings, reports, and the Record (with floor debates)--are essential for researchers investigating the legislative intent behind enactment of a federal law. See the Gallagher guide on Federal Legislative History for more information. The clock is clicking and the peeple are waiting--it's time to get your peep on! 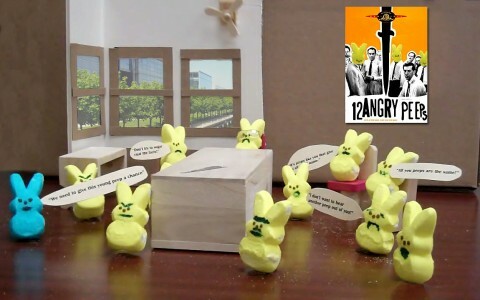 The American Bar Association's annual Peeps in the Law contest deadline is April 2d. For inspiration, check out the peepular entries from previous contests in 2011, 2010, and 2009. Photo credit: Peeps in the Law Story 3, 12 Angry Peeps, ABA Journal. Penn Intellectual Property Group is presenting their Annual Symposium on Fashion Law this month and has released a poster/flyer seen below. Louis Vuitton’s Director of Civil Enforcement, Michael Pantalony, did not take kindly to the print used in the poster and sent this letter to Penn Law Dean Michael Fitts. The University of Pennsylvania’s associate general counsel, Robert Firestone responded with this letter, where he disagreed with Pantalony’s allegation that the poster infringes Louis Vuitton’s trademarks and also graciously extended an invitation for Pantalony to attend the symposium. The National Law Journal’s Sheri Qualters covered the disagreement between Louis Vuitton and Penn Law in this article along with comments from intellectual property and trademark experts. If all this conflict or studying for finals has whirled you into a frenzy and you need some retail therapy, visit the Louis Vuitton website for some online shopping. Spinelli’s Law Librarian’s Reference Shelf from HeinOnline is a new digital library that organizes tools and reference materials for law librarians into one central collection. Legal Dictionaries: More than one hundred legal dictionaries, including classics like Bouvier’s Law Dictionary and Concise Encyclopedia (1914) and interesting specialized dictionaries like Criminal Slang: The Vernacular of the Underworld Lingo (2003). Legal Research Guides: A wide range of topics, such as Federal Income Tax Law and Environmental Crimes and Corporate Responsibility. The collection also includes unique guides that you are unlikely to find elsewhere, such as the Legal Research Guide to American Thoroughbred Racing Law for Scholars, Practitioners and Participants. Legal Bibliographies: An assortment of bibliographies like the Guide to American Law Institute Publications and Recommended Publications for Legal Research. Searching these resources is straightforward--you can search text or narrow your focus by choosing a specific topic like Legal Dictionaries or Bibliographies. Like all of the other collections on HeinOnline, Spinelli's Law Librarian's Reference Shelf is restricted to University of Washington faculty, students, and staff and to other users who visit one of the UW Libraries. The Voting Rights Act of 1965 was signed into law in August, but in many respects, this month marks the Act's true anniversary. 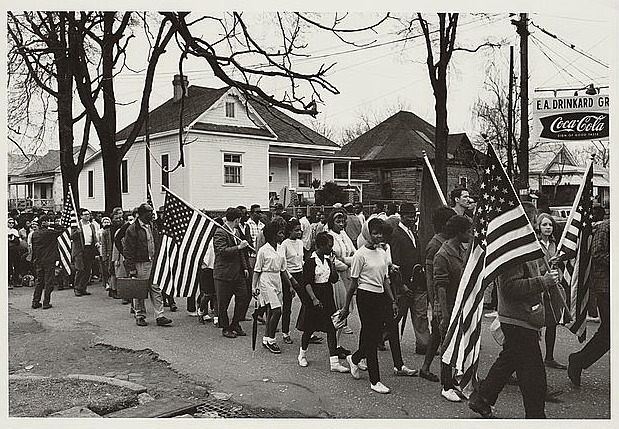 Indeed, most observers would agree that the immediate impetus behind this landmark legislation was the Selma-to-Montgomery march for voting rights, which started on March 7, 1965 ("Bloody Sunday"). Besides being a good time to reflect on this history, it is also a good time to read about it. 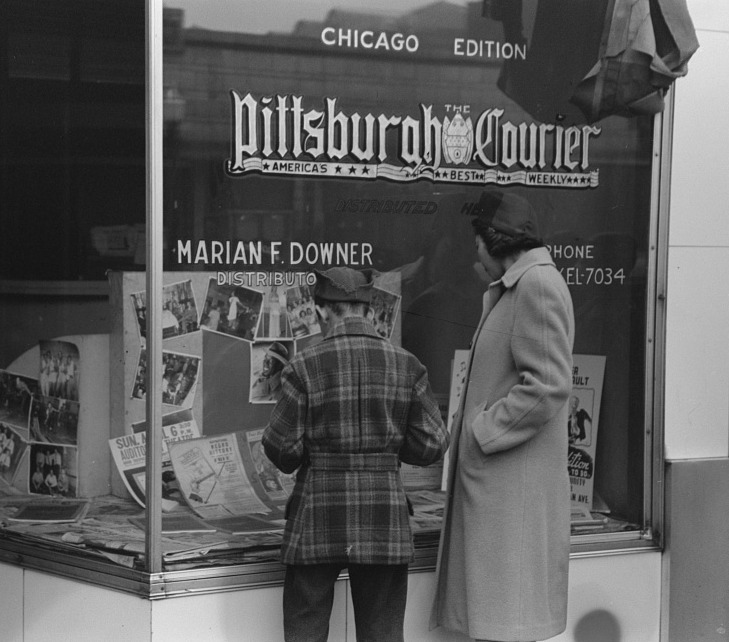 Now through March 15, UW students, faculty, and staff have access to the Pittsburgh Courier, the New York Amsterdam News, and the Baltimore Afro-American—three preeminent African American newspapers that chronicled and helped shape the civil rights movement in this country. These titles are being evaluated as part of a broader ProQuest Historical Newspapers trial. Currently, when it comes to the pantheon of the historical Black press, the UW library system subscribes only to the Chicago Defender. Users, for their part, can provide feedback to the library staff by clicking the ask us! link. 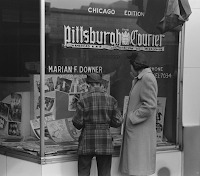 Newspapers like the Courier, the Amsterdam News, and the Afro-American are wonderful resources in any context, but they are especially useful for purposes of conducting civil-rights research. With any luck, these titles will become part of UW's regular subscription package. For now, we have an extraordinary opportunity to read the words that shaped our history. Photo credits: (top) Library of Congress, Prints & Photographs Division, Miscellaneous Items in High Demand (Collection), LC-DIG-ppmsca-08102. Peter Pettus, photographer. (lower) Library of Congress, Prints & Photographs Division, FSA/OWI Collection, LC-USF33-012992-M3. Russell Lee, photographer. As finals approach, it is sometimes nice to have a distraction from outlines, readings, and papers. Thankfully, the UW Libraries has resources to provide such distractions, including the Readex Serial Set Maps. For the unfamiliar, the U.S. Serial Set contains U.S. Senate and House of Representatives reports, documents, and journals. These materials are frequently used when conducting legislative history research. Conveniently, the UW provides access to the Serial Set electronically through the Readex U.S. Congressional Serial Set. Coverage ranges from 1817 to 1980. For more recent congressional documents seethe Gallagher guide on Federal Legislative History. But putting aside the greater utility of the Serial Set for a moment, the set also contains maps from various surveys and public works projects. You can browse the maps by state and then by county/city. I, personally, wastedtime took a break from work to browse through maps of my hometown and came across sketches of my neighborhood. The set is also text searchable. For example a search for “University of Washington” returns a map of the area around Lake Washington. In case the value of these maps has not resonated with you quite yet, check out the following reports about a septuagenarian who received a thirty-month sentence for cutting maps out of physical copies of the Serial Set and selling them on eBay. For those who want explore older maps even further, checkout this collection of Early Washington Maps. 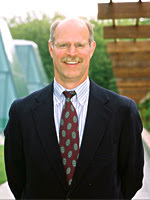 The collection is a collaboration between Washington State University Libraries and the University of Washington Libraries. You can navigate the Early Washington Maps collection by running text searches or by browsing, as well.